The Stewart Motor Corporation of Buffalo, New York, began building commercial vehicles in 1912. For 1915 and 1916 only, they offered a passenger car, before returning to what they did best. 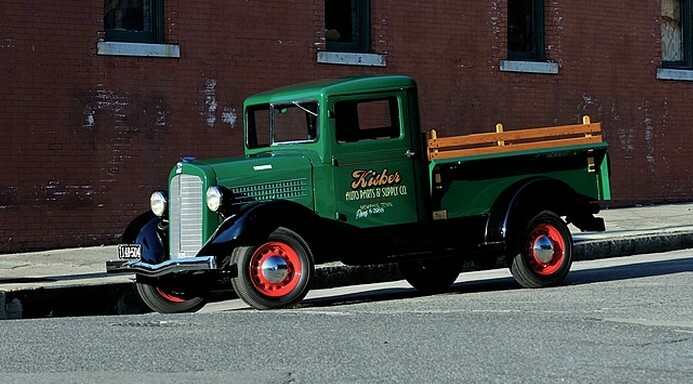 In 1926 they introduced the “Buddy” – a light truck with road-going performance. What you see here is just such a model, which was likely produced up through 1937 (Stewart folded in 1940). It’s powered by a 2.7-liter straight-four. Today, this wouldn’t be considered a commercial vehicle, but an everyday pickup truck. And that’s why this is so interesting. This is a relatively late example (most car companies that the Depression was going to kill were already dead by this point and the only survivors are the ones that are household names today). So here’s a light pickup that would’ve competed against Ford and Chevrolet from a company you’ve probably never heard of. Check out more here and see more from Mecum here. Update: Not sold, high bid of $37,500. Update II: Sold, Auctions America, Auburn Fall 2015, $20,350. This entry was posted in Uncategorized and tagged 1935, 40h, auctions, buddy, cars, classic cars, mecum, pickup, stewart by classiccarweekly. Bookmark the permalink.